The board was all giggles as Clerk Calvillo called roll to open yesterday's board meeting. We may never know what caused an outburst of Supervisor Avalos' recognizable laugh, but we do know Calvillo covered for Supervisor Kim who had to step out of the room on an important phone call during roll. A little laughter and camaraderie to open the meeting was kind of nice, actually. 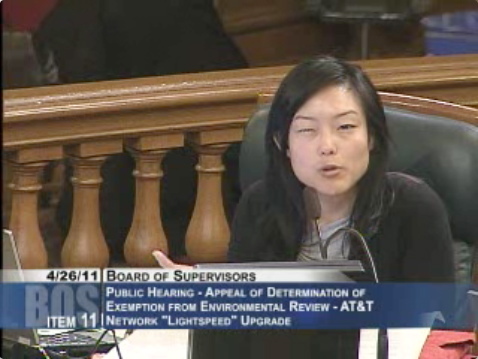 It was as if everyone had already accepted how miserable the hearing on AT&T's sidewalk boxes was going to be. (Pretty miserable.) Too bad the light mood didn't last that long, because Sean Elsbernd had to go and play debbie downer on everyone's off-leash doggie dreams. First things first: Scott Wiener's Good Samaritan Occupancy legislation went right on through on another 11-0 vote. No surprises there and we already doled out points for this last week anyway. Moving on to the GGNRA's off-leash policy: Wiener's resolution to oppose it seemed like it had everyone on board until Supervisor Elsbernd had to go and object. Doesn't Sean know an objection to a resolution opposing a first draft of a policy of another agency is exactly the same as hating dogs? That must be what everyone else thought because every point of discussion on the item had to be prefaced with a wistful memory of childhood canine pals. Supervisor Avalos took the chance to talk about his time working with the GGNRA ("It's quite a diamond we have here in San Francisco.") and how he's such a dog lover. ("We don't have one in my house, but there's always a lot of dogs on my block, running around.") That was right before he Mayorsplained why this was such a difficult issue. [Mayorsplain: verb, to explain something to someone as though you were running the whole town.] As he said, we've got environmentalists and dog lovers and dog lovers who are environmentalists all mucking things up and geez - why didn't the parks service think of the needs of San Francisco when they thought up their policy? -1 for Avalos because having a lot of dogs on your block is an even lamer version of "but I have [minority] friends!" Farrell went next to tell the room about his carefree days walking his dog along Crissy Field. The Marina supervisor thinks the resolution is solid enough for his district, but transcribing an out of context quote like "a place where people recreate with their dogs" makes us feel a little awkward. We'll deduct 0.5 from Supervisor Farrell for forgetting about the word-based media..
Elsbernd, on the other hand, skipped the doggie platitudes and went straight to the sob story. Apparently a lot of people in his district are actually afraid to go to Fort Funston. (Feel free to add "terrified of dogs" to the list of stereotypes about people who live in the Outer Whatevers.) More annoying though, was when Elsbernd played the America's Cup card: If the board opposes the National Parks Service on this issue, he explained, they might feel butthurt when we need to pull favors to use park land for the America's Cup down the road. He called the resolution a "slap in the face to an equal government partner" before angrily pushing away his microphone. -1 for Elsbernd, because: A) gross, America's Cup. And B) the angry microphone thing doesn't look nearly as cool as you think it does with those cheesy podium mics in the board chambers. Ross Mirkarimi thankfully got us back on topic with a predictably long story about his personal history of dog ownership that segued nicely in to a discussion of why we don't want to piss off the Park's Service. For as many words as Ross tends to use, he only uttered "America's Cup" once and that was so he could say he didn't want to bring it up. +1 for Ross Mirkarimi. After the vote on the GGNRA thing, we have to give back Elsbernd's lost point. His firey Irish thing flared up and he scolded everyone for voting down a clause about the endangered species in Sharpe Park. Avalos was heard uttering, "touché!" Malia Cohen smoothly introduced her resolutions for the Bayview Opera House and Arelious Walker Stairway redevelopment projects without so much as an "um." And she even had the redevelopment staff ready to provide a summary of the project. A tedious powerpoint presentation followed, sure, but we can't fault Supervisor Cohen for that. +1 to Cohen for nailing it on the Opera house, even if no one really cares about that $1.1 million staircase. In the end, it's nice to see the ladies picking up some momentum, so we'll deem Supervisors Kim and Cohen this week's real winners. We're kind of confused about how a Mayoral candidate managed to dig himself such a deep hole, but the numbers don't lie.